When TouchPose was released on Cydia store a couple of weeks ago, it immediately grabbed itself quite a number of fans, mainly amongst the video creation and editing world. The whole concept of TouchPose was to show a visual indication on the jailbroken device screen whenever it recognized a user’s touch. To a lot of people, the indication of a touch may not seem like a much-needed addition to iOS, but for those who are heavily involved in the YouTube world and regularly make video demonstrations, or for developers who are creating demo videos of their tweaks, the visual display of a touch is a much desired feature. The developer has subsequently released his commercial version of the package called TouchPose+ and although the tweak is built around the same functionality, it does bring with it a number of additional options for those users who are willing to pay a dollar or two for their tweaks. The younger but more mature sibling of TouchPose brings with it a number of configurable options that allow users to change the size and default color of the screen indicator as well as being able to SSH directly into the tweak and add custom images that will show up on the display when a touch is recognized. All of the available options are accessed through the native Settings.app on the device, with only a small amount of technical knowledge required to be able to add custom images to the package. Considering the TouchPose+ is available for $1.00, it would seem like a very good option for those users who regularly create iOS device based videos due to the fact that it can be customized to suit a company logo or application icon. 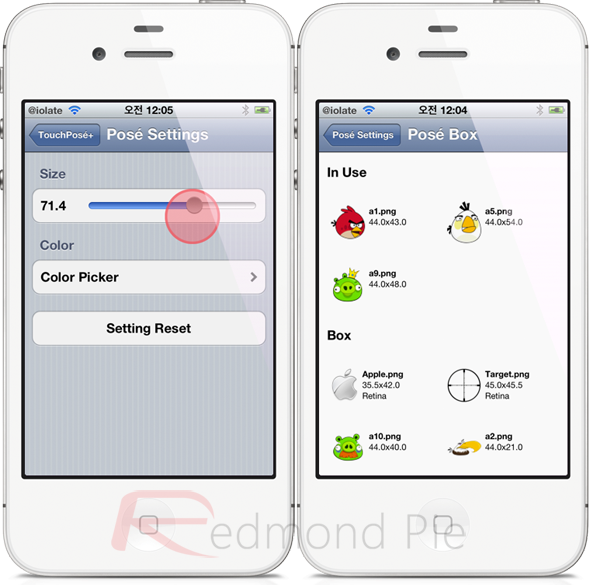 TouchPose+ is available to download for $1.00 from the BigBoss repository and requires a device running iOS 4.2 or above.